After two games in the sea, Ken Levin and Irrational Games is taking to the Bioshock franchise to the skies with their latest game, BioShock Infinite. I’ve been anticipating this game after seeing it at E3 a few years ago and after a few delays, it’s finally here. Has it been worth the wait? BioShock Infinite puts you in the role of Booker DeWitt. As Booker, you’re asked to go to the floating city of Columbia and find Elizabeth, who has been held captive there for the past twelve years. She’s no ordinary person as she has powers that are powerful and dangerous. You will also control various powers, like in the original BioShock, as you traverse Columbia and try to escape with Elizabeth. 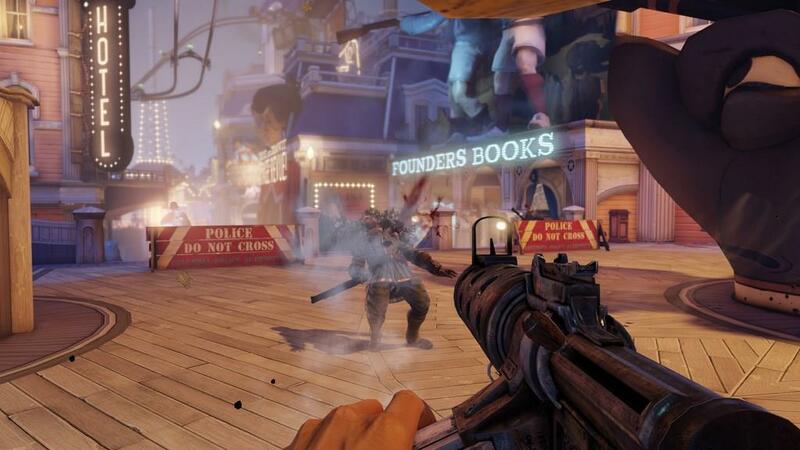 The city is embroiled in a war between two two groups, the Founders and the Vox Populi, and it wouldn’t be a BioShock game without some twist or two thrown in the story. Like Rapture in BioShock, Columbia in BioShock Infinite oozes with style, in this case, the growth period for American exceptionalism. The environment has such a rich design making for one of the more fun environments out there to play in. 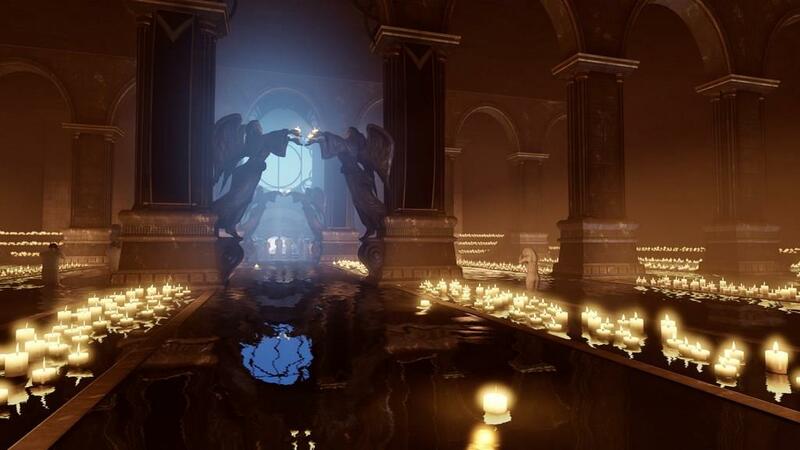 Unlike Rapture, Columbia’s setting allows for a much more open world to play in. No longer are you confined in small places as the openness of Columbia affords for some new ways to play. To help you get some more history on Columbia, there are kinetoscopes scattered throughout the world which play about a minute long silent movie complete with film graininess and cue cards giving you more insight into the world. It's a place you want to take your time and soak everything in. You don't want to rush through this game and you want to explore as much as possible because the rich history of Columbia, Booker, Elizabeth, and others in the game is really make for a wonderful story to experience. The graphics don't have the highest polygon count, but it's the total package of graphics and world that makes BioShock Infinite pleasing to the eye.The textures used throughout the game are just perfect in conveying the artistic rendition of an alternate 1912 city. If there’s one thing the team at Irrational is great at, it’s design on both a small and large scale. Yes, there are incredible set pieces that really bring Columbia to life. From the large statues that pay tribute to past historical figures like Benjamin Franklin, George Washington, and John Wilkes Booth to the colonial inspired architecture, there’s plenty to see that will have you in awe as you travel through the different areas of Columbia. But it’s also the little things that help make Columbia seem alive. For example, early on you’ll pass by a barber shop quartet singing “God Only Knows” as they float up to your point of view on an airship from below. You’ll see little hummingbirds fly around during the early parts of the game. A sideshow demonstration of vigor powers foreshadows what you’ll be able to do. Attention to detail is top notch in BioShock Infinite with everything combined to help make Columbia such an interesting city to be in. Booker’s also not the strong, silent type as he has a voice in BioShock Infinite. The conversations between Elizabeth and Booker help establish and develop the characters allowing you to feel for them more as you go through the game. There are plenty of instances where Booker and Elizabeth participate in small talk, that when added up, shows you the strong bond that develops between the two as you play the game. While the silent protagonist does work in some games, like the two previous BioShocks, Booker’s dialogue is a welcome change to the series. BioShock Infinite does borrow a lot of aspects from previous games. The recorded messages return to add some context to some of the characters motivations and story. What were plasmids before are now known as vigors and you have a primary and secondary power by either tapping the button or holding down the button. You’ll also be able to increase the vigor’s abilities as well. Vending machines return to let you purchase equipment and improvement with money that you find around Columbia, For those that played the previous game, the familiar gameplay will have you feeling right at home and being able to get into the game quickly and easily. Even some of the scripted events will be familiar. Don’t be surprised to see characters behind areas of unbreakable glass conversing with you or even carrying out a deed that you know won’t be good. These scripted events are important in conveying the story, so players of past BioShock games will find these events to be similiar in style. The changes with Infinite though really take the BioShock series to another level. You aren’t alone for much of the story and even though you are escorting Elizabeth, she is of no hinderance. She stays out of the way in combat and even goes and helps you too. When you are running low on health, salt, or ammo, she might find some and toss it to you. She’s saved me a few times by giving me health just as I was about to run out or tossing me some ammo for my almost depleted machine gun. 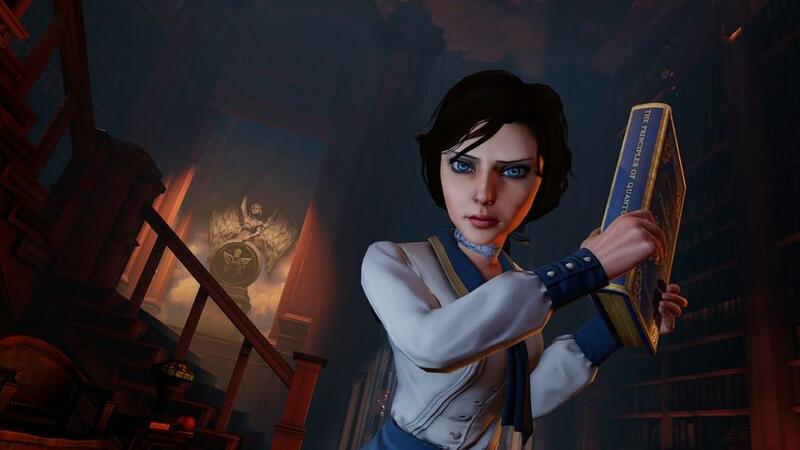 She can’t die and Irrational Games did a great job in making sure she’s both helpful and not hurtful. Throughout the game, there will be tears in the fabric of space where Elizabeth can bring things forth or you can walk through to an alternate dimension. You’ll only be able to use one at a time, but having Elizabeth bring in some help in a form of a turret or health kits really increases her usefulness in the game. She’s definitely one companion you don’t mind having around, following you. As you probably saw in some of the previews, there are rails that you can latch onto and glide around. You’ll need to do so to reach other parts of the game. At first, it looked like it was going to be hard to control, but Irrational Games made it really easy as when you point to a rail, you just press the jump button to climb on. The story says the hook is magnetic so you won’t miss. You can easily switch directions on the rail and it’s an exhilarating feeling just gliding around at high speeds while gunning the enemy down. The system is simplistic to get a handle to and it works incredibly well. The ending, the ending is thought provoking. As a player of previous BioShock games, I figured there would be something that didn't seem as it was initially presented. It can get pretty confusing as a lot is thrown at you in the last twenty minutes, but it is oh so worth it. It elicits many different emotions and it's sure to have a lasting impression on you. It’s hard to find faults with the game, but I did run into a few. The AI can be a hit or miss though. As you can see in the video below, I had one guy just take bullets to the back of the head via a turret and he had no reaction to it. Another thing that brought me out of the illusion of being in Columbia is the way at times there was no reactions by the citizens after a very loud firefight that I was in. You’d think the citizens would be cowering after hearing a large amount of gunfire and screaming, but I’ve walked into a place where it was probably less than a hundred feet from all the action taking place and everyone was just going about their business. As soon as I fired one shot in the air near them though, they started to run away so while there are reactions to me firing a gun, there were a few times it seemed the public would have that reaction because of the close proximity of when I finished my conflict. Also, a few times the enemies didn't react to me in the room until I either moved a little closer to them or a small amount of time passed. Seeing frozen enemies for a few seconds threw me off a little bit at times. The choices that are presented to you in the game are more pronounced this time, but it doesn't have any affect on the final. Don't go expecting to change the outcome by what you do as all the choices in the game are cosmetic or the result shows up a little bit later. Some maybe disappointed in that, but I don't think you need to have a branching story that changes the ending in order to have a good game. Playing on my i7-2600K with a GeForce GTX 580 running Windows 8, the game never crashed, which I commend Irrational for. It also ran pretty smooth with all the options turned up high. Unfortunately, there wasn't a good 3D Vision profile yet, so I wasn't able to play this game in 3D. I'd love to have been able to glide around on rails and see the entir world in 3D as I'm flying through it. Perhaps NVIDIA will be providing a solid profile soon as I think this game would work well with 3D Vision. 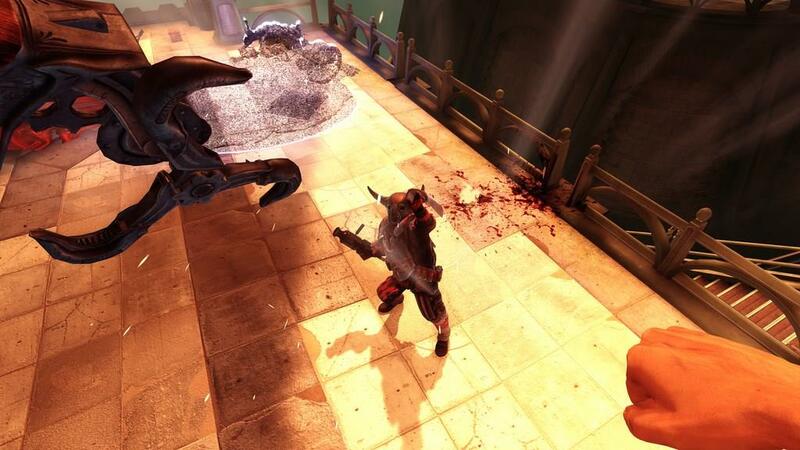 Has BioShock Infinite been worth the wait? Absolutely. Does it live up to hype? It pretty much does. The story, environment, action, characters, it all comes together to give you a rollercoaster ride that will probably be talked about for a long time. Irrational Games has taken what made BioShock good, improved upon it, added in some great new features, and removed the annoyances of the first one to really produce a very polished and well thought out game. Do yourself a favor and pick up this game. Take your time to go through it and enjoy what may well be the best game this year. BioShock Infinite is such a fun game with an incredible atmosphere. The long wait has been worth it and Irrational Games has done an incredible job at bringing Booker, Elizabeth, and Columbia to life.